 Freediving has a number of different types of dive that are recognized competitively. Different agencies have slight variations on what these are called but they all follow the same basic concept. 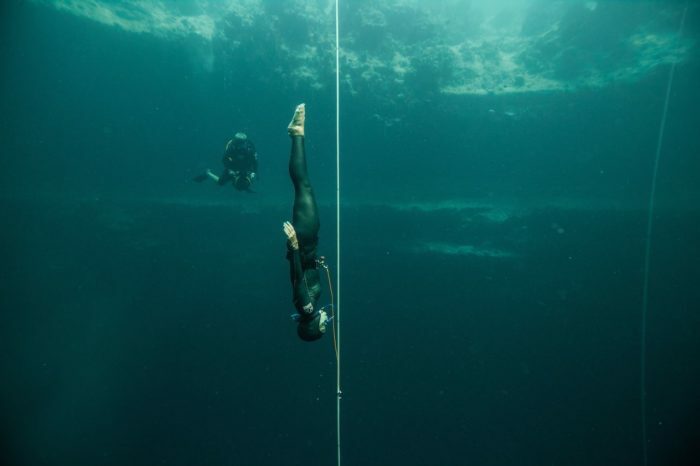 Probably the most common depth version of Freediving. The diver descends on a using either bi-fins or a monofin and typically a wetsuit and a small amount of weight. The diver is not allowed to pull on any guide ropes or change the weight used. Sofia Gomez Uribe from Colombia is an ex-swimmer and it shows. On her way down to a Colombian record of 51 meters CNF she had perfect technique from her finger tips down to her pointed toes. This dive also bagged her the silver medal in the category, and with 3 Colombian records across all disciplines, she finished in a strong fourth place. 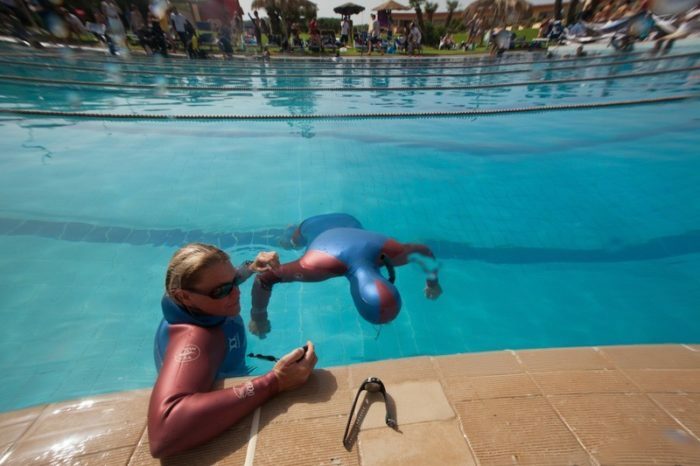 In this discipline, the diver wears a wetsuit and a small amount of weight without the need of any type of fin. The diver uses only muscle strength to propel them downwards and back up again is generally regarded as the most difficult and pure discipline from a sporting perspective. Sayuri Kinoshita from Japan was the overall woman’s gold medal winner, with strong dives across the board. Here she is on her way down to an 80 meter FIM Japanese record. This discipline is similar to Constant Weight No Fins in that the diver uses only a wetsuit and a small amount of weight, however, in this case, the diver can only use the guide rope for propulsion. You see divers doing this discipline both in a “head down” and “head up” position. The first of the pool disciplines. 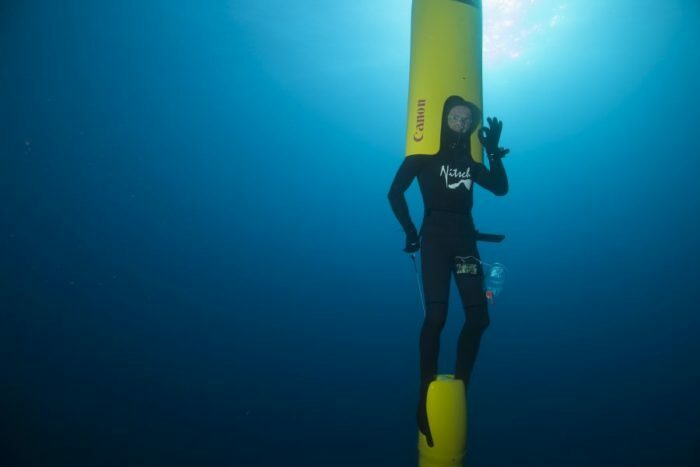 Here the diver travels in a horizontal position underwater (typically in a pool), with a propulsion aid such as bi-fins or a monofin, in an effort to cover the greatest distance possible. 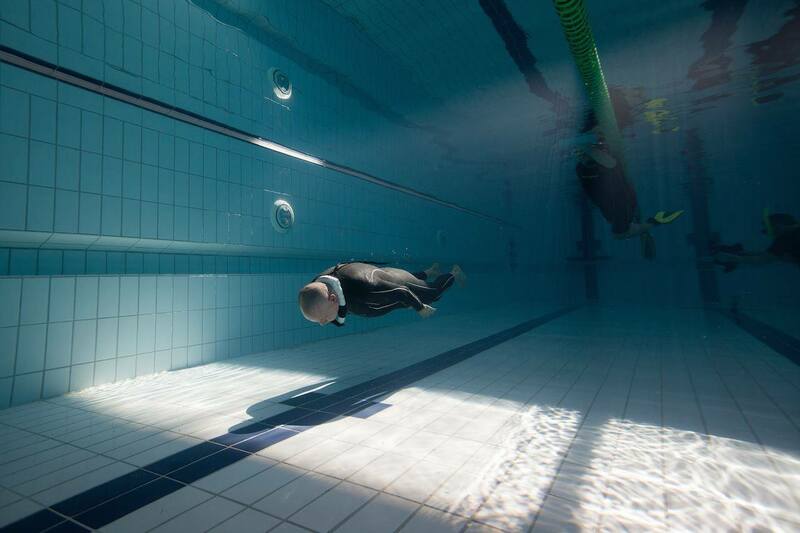 The diver in this discipline again tries to cover the greatest distance possible in a pool but this time all propulsion aids/fins are prohibited so divers just use their arms and legs to propel themselves. Speed-Endurance (S&E) Apnea is a CMAS specific discipline where the athlete aims at covering a fixed distance within the shortest possible time while keeping his/her body underwater. This discipline takes place in the pool and consists of covering stretches of the pool length by alternating apnea swimming with passive recoveries at the end of each stretch. Speed-Endurance (S&E) Apnea may be performed with fins or without fins. When used, bi-fins or monofin must be moved solely by the athlete’s muscular strength, without the aid of any mechanism, including mechanisms triggered by the muscular system. This discipline requires the diver to hold their breath for as long as possible floating face down with the respiratory tracts submerged. This is the only discipline where performance is measured by duration. 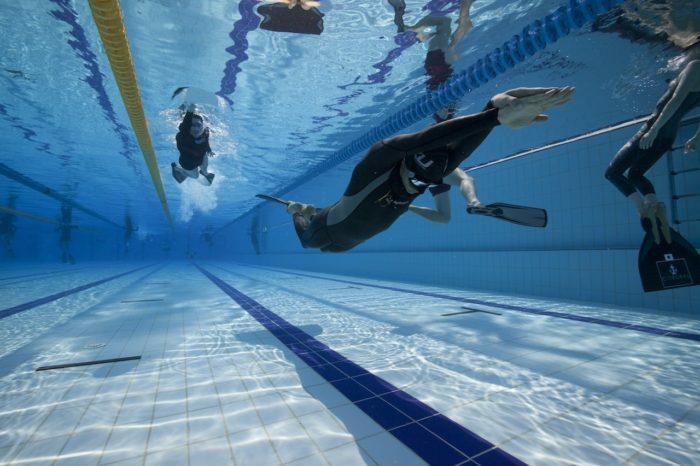 This discipline is one of the two more “extreme” versions of the sport and popularized by Luc Besson’s movie “The Big Blue”. 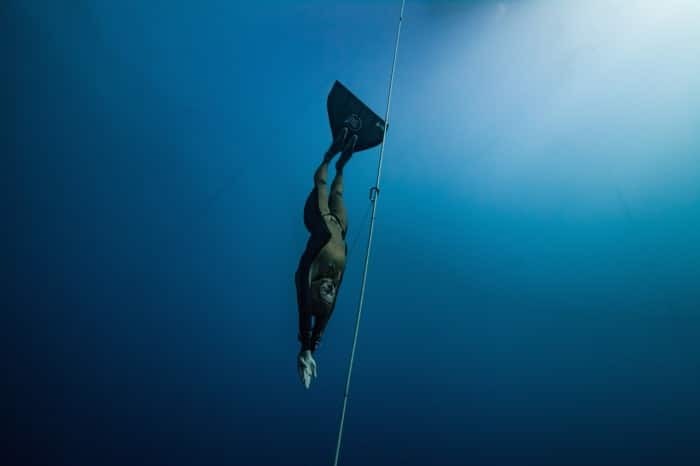 Here the diver descends with the help of a heavy weight (typically in the form of a sled) to a pre-agreed depth and then ascends to the surface using their own strength including fins if they choose to. This is the true expression of human endurance underwater. 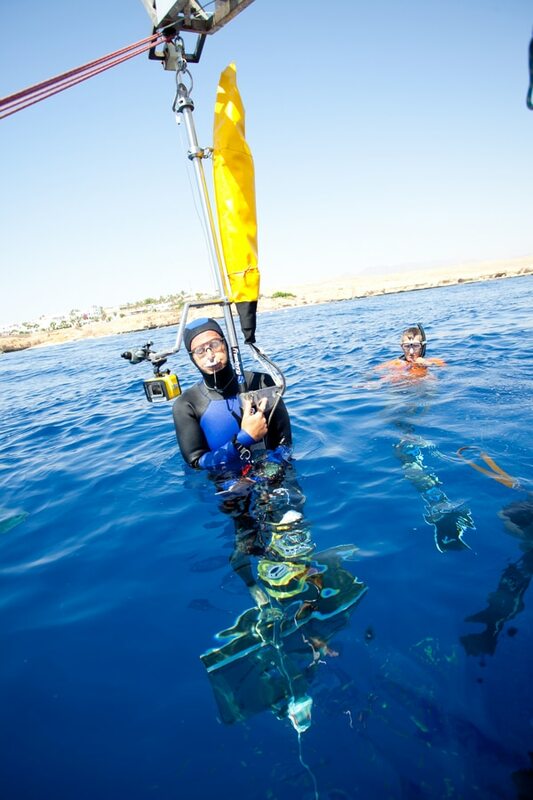 The diver descends with the help of a heavy weight then ascends using any method of choice – traditionally a lift bag but in more recent times fast counter-balance pulley systems. 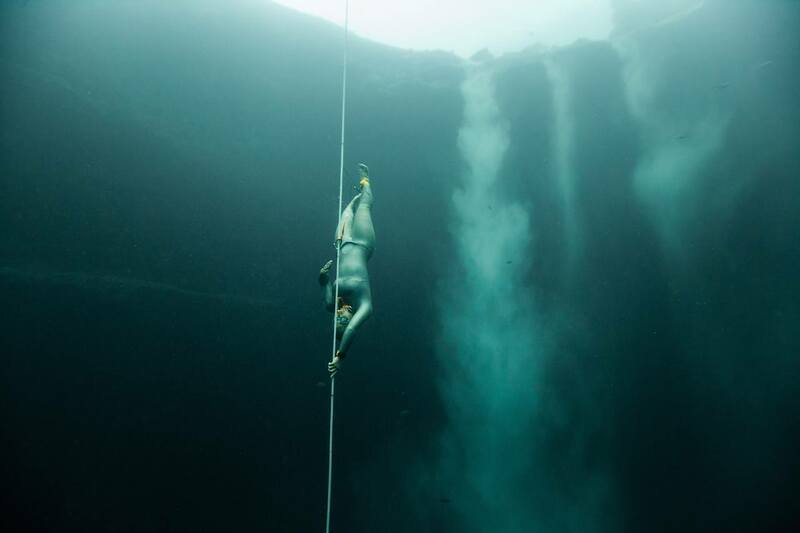 In this discipline, divers descend to depths deeper than some submarines can operate.